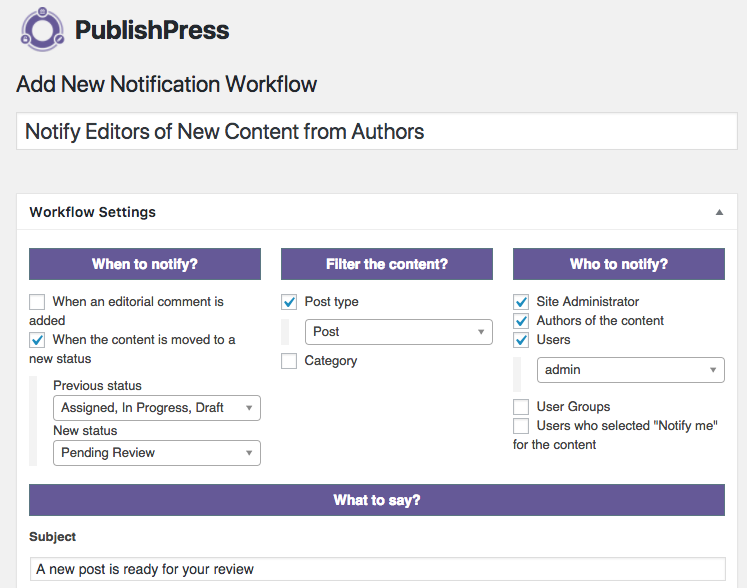 We received an email from a PublishPress user who wanted to set up a content workflow for their team. This list below shows the workflow they wanted. Administrators will assign content to Authors who write the content and then submit it back to the Administrators for publishing. I will add people to an “Authors” user group. Their permissions will be to send content to statuses such as “In Progress”, “Draft”, and “Pending Review”. When an Author has finishd their work, they will move it to “Pending Review”. When a post moves to “Pending Review”, the administrators will get notified that post is ready for review. Based on the Content Checklist add-on, a number of things must be done before publishing the post: correct category selected, correct tags added, etc. For this tutorial, we’ll be using the free PublishPress plugin, plus the Permissions add-on and the Content Checklist add-on. Install all three of these in your WordPress site. Our next step will be to create some authors who will write our content. Go to Users > Add New. Create new accounts for each author. When creating the account, place the users into the “Author” role. Now we’re going to control what authors can and can not do. If you’re new to WordPress, here’s a guide to what authors can and can not do in a default WordPress site. The Permissions add-on is the way you can customize the default Author permissions. This add-on controls which statuses are available to user roles. In the image below, people in the Author role can move content to the “In Progress”, “Draft”, and “Pending Review” statuses. You’ll notice that Authors cannot move content to “Published”. Now that our permissions are ready, let’s set up notifications so that everyone gets notified at the right times. Go to PublishPress > Notifications. When to Notify: Here you can choose to notify people when content in “Assigned”, “In Progress” or “Draft” is moved to the “Pending Review” status. Filter the content? Choose “Post” as the Post type. Who to notify? Choose the people who will approve the content. If you want, you can add more notifications for other groups. For example, you can notify “Authors of the content” when content is sent to the “Assigned” status. The Content Checklist add-on allows you to set criteria that your writers should (or have to!) follow. This add-on allows you to set a maximum and minimum value for categories, tags, and words. For example, you can now ask your users to write between 100 and 500 words or add between 3 and 5 tags. 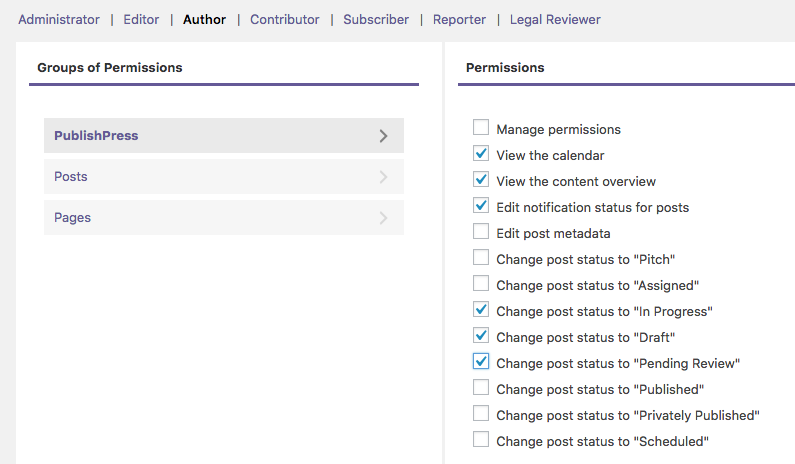 Go to PublishPress > Settings > Checklist and you can create the requirements that you want people to complete before a post is published. Have an “Editor” user create a post and assign an “Author” user as the content author. Do they get an email? Have the “Author” log in. Can they move the content to the “In Progress” or “Draft” and “Pending Review” status? Do “Editor” and “Administrator” users get an email when posts are moved to “Pending Review”? Does the Content Checklist work as you want?